TowBoatU.S. 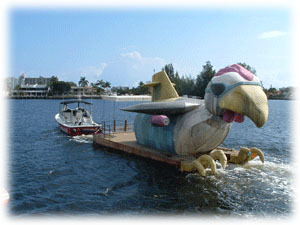 Ft. Lauderdale has been providing towing services to boaters of South Florida for more than twenty years. Examples of towing service are towing your vessel from its point of breakdown to your port of choice, fuel delivery and battery jumps, and soft ungroundings. If your boat breaks down locally, in the Bahamas, or anywhere else, we have the experience and equipment to bring your boat home. TowBoatU.S. 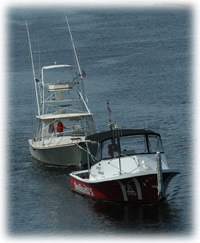 Ft. Lauderdale provides towing services for boats of all sizes. We tow everything from jet skis to mega-yachts. Towing packages are available through BoatU.S. 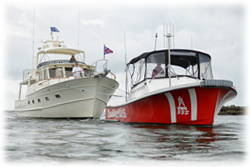 (Boat Owners Association of The United States) for recreational boaters, founded in 1966 and based on "service, savings and representation" for boaters, their Towing Program is one of many services they provide. For more information, please vist our BoatU.S. Membership page. We are part of TowBoatU.S., the largest fleet of professionally-equipped towing companies in the country, licensed to represent BoatU.S. on the water and to provide full benefit towing service to their members. TowBoatU.S. 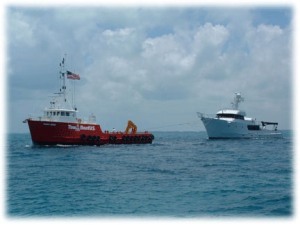 Ft. Lauderdale provides a towing package for commercial vessels and rental boats in the Broward County area. Contact us for more information. Towing service is not salvage service. Finding your boat hard aground, stuck on the rocks, beached, sinking or any other similar situation is salvage and not treated as a tow. Read more about salvage services on our Salvage Page. If you need a tow, call us on VHF 16 or on the telephone. We have captains standing by 24 hours a day, 7 days a week, 365 days a year to assist you.